The island of Corfu in Greece won the 2018 European Film Location Award, the European Film Commission Network (EUFCN) announced on Wednesday. 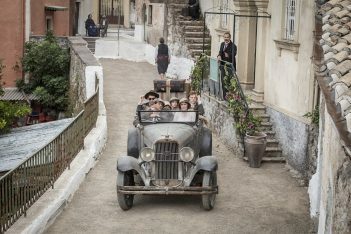 Corfu was chosen from among 12 European locations as the best of 2018, in recognition of the key role it played in the TV series The Durrells. In its second year, the 2018 European Film Location Award competition was organized by the EUFCN, in collaboration with Cineuropa. The EUFCN consists of 90 members from 30 countries and promotes European locations and the continent’s film industry. “Locations represent the soul of each film commission,” EUFCN President Truls Kontny said. Each member of the EUFCN had the opportunity to submit a film location – a specific place used recently in films or TV series. The general public had a chance to vote for their favorite location online, via the Cineuropa website. Greece’s EUFCN member is the Hellenic Film Commission. “We all strongly believe that this award can increase the visibility of European locations all over the world,” Kontny added. Located on the north-western side of Greece, in the Ionian Sea, Corfu is among the most popular Greek islands. The island is known for having a cosmopolitan feeling combined with a special, traditional character. Apart from the wonderful beaches, the highlight of the island is the Old Town, with its characteristic Venetian style. The prize was picked up by the director of the Hellenic Film Commission, Venia Vergou, and coordinator Stavroula Geronimaki, who both strive to promote the island’s cinematic appeal to the rest of the world. “The 2018 Best European Film Location Award is very rewarding, as it communicates to the entire world how unique Greek locations are,” Vergou said, underlining that destinations in Greece have inspired writers, directors and producers for many years. “This prize underlines the systematic work of the Hellenic Film Commission in promoting Greek locations. It also showcases the impact that cultural heritage and monuments have on audiovisual works – the Old Town of Corfu island, which contributed to the success of the TV series The Durrells, is one of the many UNESCO-protected monuments in Greece,” said Vergou. The story of the TV series The Durrells is based on the autobiographical trilogy of books by Gerald Durrell, the naturalist, explorer, writer and conservationist, about his family settling on Corfu island in 1933. The TV series wrapped its fourth season in October this year; it was written by BAFTA Award nominee Simon Nye and directed by Roger Goldby. Sid Gentle Films Ltd produced it in co-production with Masterpiece. EUFCN contributes to the recognition of the audiovisual sector’s economic importance and its impact on the creative industries.